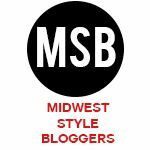 Linking up again this week with Jenn for another edition of WIAW. Today will be a look at my meals eaten on Monday. Breakfast was a fruit smoothie. 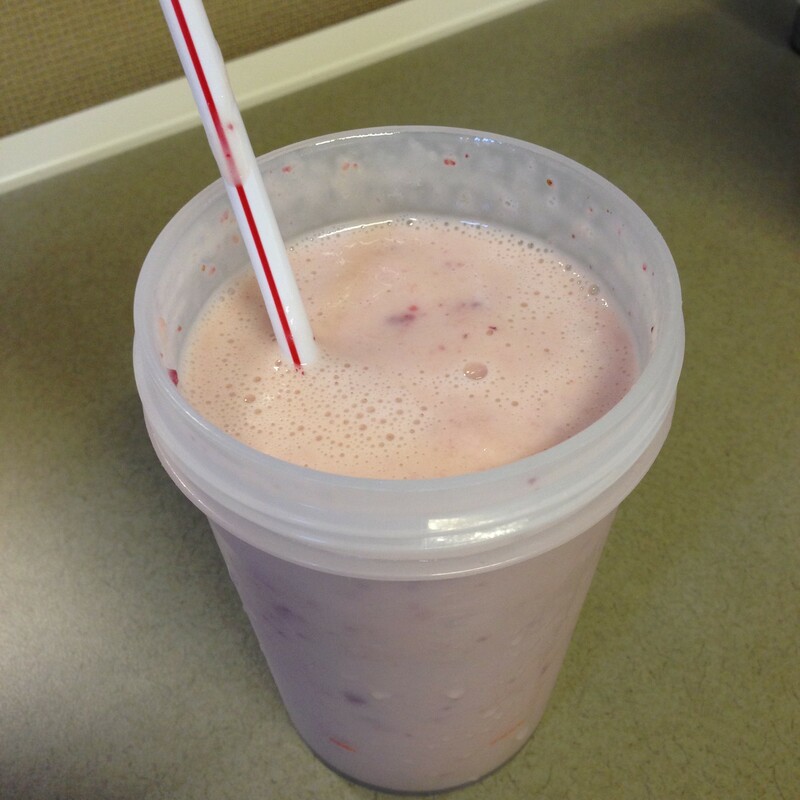 On Sunday afternoon, Kevin had a craving for a strawberry smoothie so I whipped one up and it ended up being so good I recreated it for breakfast on Monday. It was tasty and held me over for a few hours. 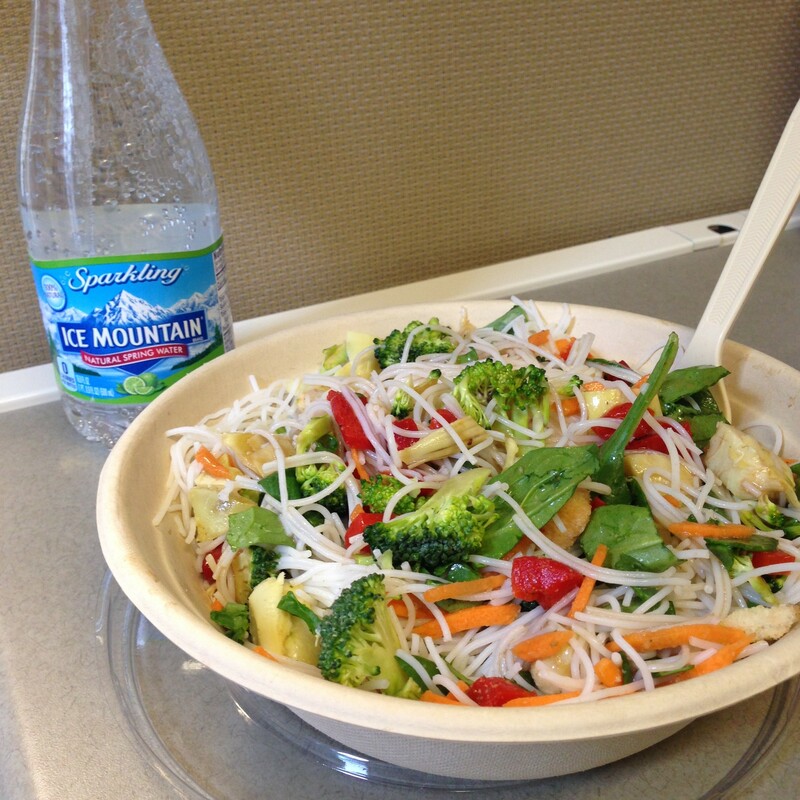 Lunch was a big ol’ rice noodle and veggie bowl from Freshii. Freshii is my go to lunch spot when I don’t bring my lunch to work. There are a ton of healthy options and it always fills me up for the entire afternoon! Dinner was a hodgepodge of anything I could find in our pantry/refrigerator (if you couldn’t tell, I did not make it to the grocery store this weekend). 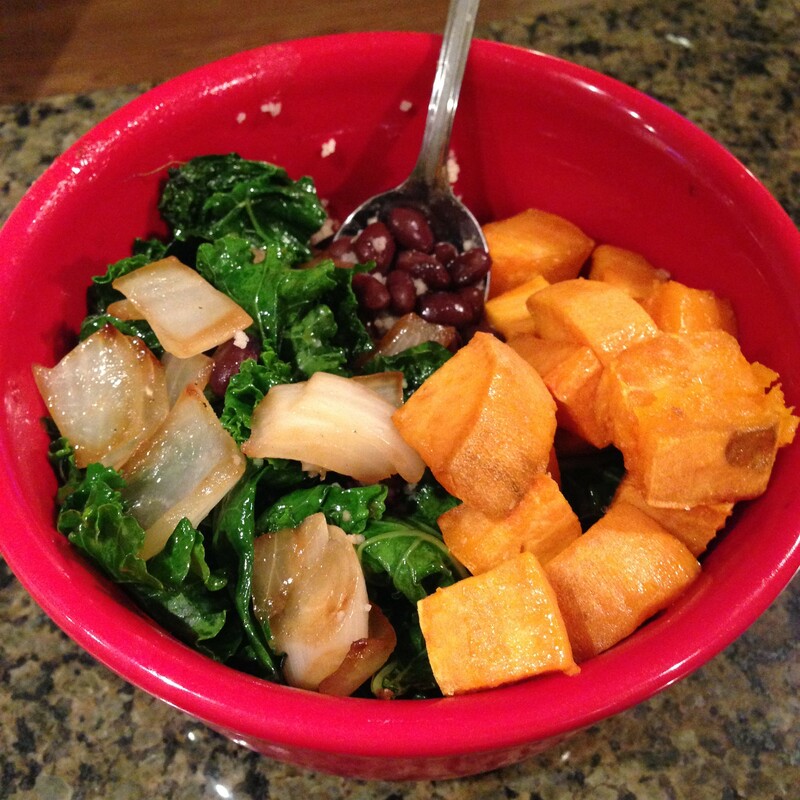 Sometimes unplanned meals turn out to be the best ones! Dessert was a “taste test” for cookies I was bringing into work the next day. 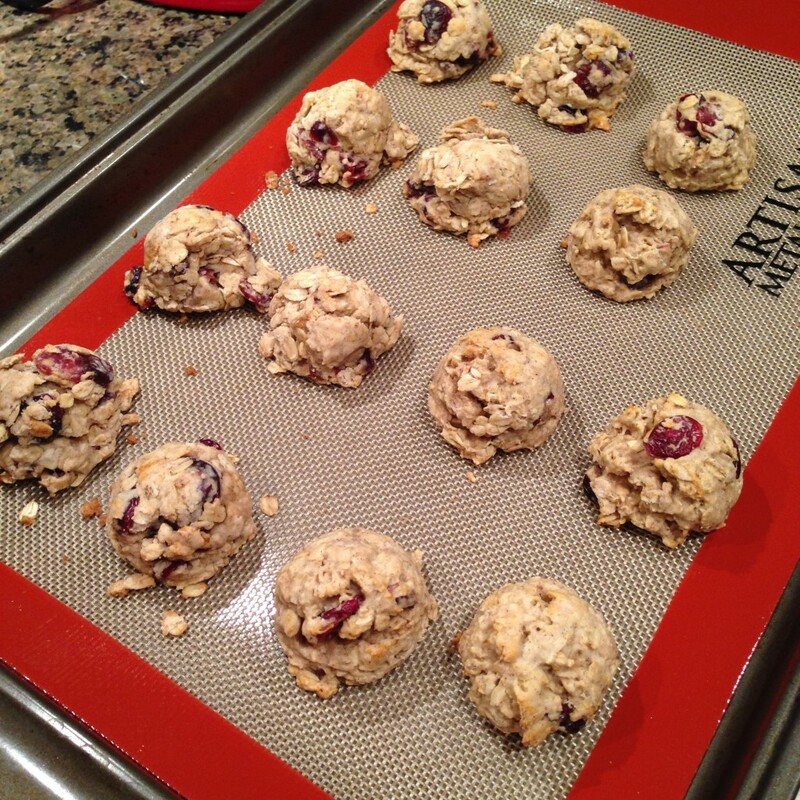 We had an office potluck to celebrate tax day so I made oatmeal cranberry cookies. I had never made these before, but found a recipe online and had all of the ingredients at home so thought I would give them a try. I’ve recently been trying to find healthier baking alternatives and have had pretty good luck with recipes so far. These cookies are vegan and have no white sugar in them. They could also easily be made gluten free by subbing out the white flour with a GF alternative. I have posted the recipe below. Start by mixing all of the dry ingredients together, then add syrups, oil, vanilla and cranberries. Be careful not to over mix. Spoon onto lightly greased, parchment or silpat surface. Bake for 8 minutes, until just turning slightly brown on edges. **Note: I had to add a splash of almond milk to my dough because it was too dry and not sticking together well on the baking sheet. What are some of your favorite “healthy” desserts? I’ve never heard of freshii before, but it sounds like they have quite the selection. The rice bowl you picked out looks and sounds awesome. You’re welcome! I am a new lover of coconut oil and use it in baking all the time! It’s so great! Your lunch looks delicious! I’ve never heard of Freshii before but I checked out the website and there are a couple of locations near me so I’m going to have to try it out ASAP! You definitely need to check out Freshii! They have fresh juices, smoothies, wraps – all kinds of good stuff! I noticed that you use Fage yogurt. .. I’ve always been a Chobani girl. . is Fage better? ?